I walked this, the 15th and final link of the Hertfordshire Chain Walk, on 1st May 2006. Since I had walked previous three links I had been able to get a copy of the Hertfordshire Chain Walk guidebook from the East Herts Footpath Society. I knew the chain walk had 15 links but for me this walk was going to be link 16. As I had surmised at the end of my notes for the previous walk it was what I called links seven and eight which were in fact just one link. A misplaced green diamond on the Ordnance Survey map leading me to walk in a figure of eight rather than a circle! Not that it really matters though. Anyway, for this link I parked in Therfield opposite the Fox and Duck pub, overlooking the village green, photo 1. From here it was only a very short walk through the village to join the walk on a track that runs North besides the water tower in photo 2. In the grounds of the water tower was an old trig point, photo 3. 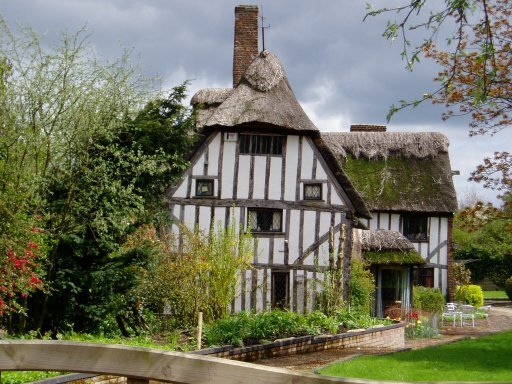 The path passes the thatched house in photo 4 and continues a short distance on to a road which the route of the Hertfordshire Chain Walk follows to the right for a short distance before taking another track off to the left on the other side of the road. 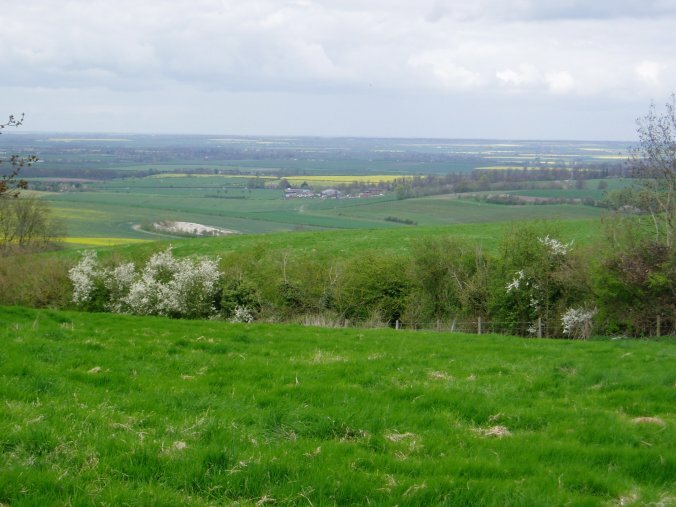 Just before this track there are very good views across the countryside over Cambridgeshire and the most northerly stretches of the chain walk, photo 5, a long way away from the start of the walk at Clay Hill on the edge of London. The path heads downhill along a tree lined path which can be seen in the foreground of photo 5 before crossing a number of wide, open fields, photo 6, as it gradually makes its way towards the A505. There was quite a strong wind blowing which was carrying the noise from the traffic on the road a long was across the fields which made me wonder how easy it was going to be to cross the dual carriage way as it sounded quite busy. On the way I passed the site of a small shooting range, in the middle of which I spotted a hare. Just before Thrift Farm is reached the Hertfordshire chain walk takes a footpath that branches off to the left across a field, photo 7, towards Jockey House Cottages. This path was located a bit further North than marked on the map my Ordnance Survey map, and a old footpath marker on a fence post also pointed across the field some distance before the actual track across the field which caused my a brief bit of confusion. Once across the field the path passes through some paddocks and past a stable and on down besides a driveway to the A505. Fortunately it did not take too long to cross over the road and the Hertfordshire Chain walk then continues down the paved driveway of Morden Grange Farm. The path passes under the railway line, photo 8 and then turns sharp left to follow the line of the railway track besides another vast, open field, photo 9. This is the most Northerly point of the chain walk. The path eventually leaves the field edge and takes a track that runs a bit closer to the railway lines, photo 10. Much of this section of path was lined by hawthorn trees which in several places had already grown across the path. If they are not cut back soon this section of path is going to get quite difficult to walk through. The field to the right of the path finally ends and the path then runs alongside a chalk quarry although this cannot be seen until just before Ashwell and Morden Station is reached. As I stopped to take the photo of the quarry, photo 11, a crackly announcement came over a speaker on a pole which more or less told me to leave the area, or words to that effect, it was a bit hard to hear exactly what was being said because of the wind. I don't know if it was an automatic message I somehow triggered or whether I was under surveillance by some central control point but a bit incongruous considering I was on a public footpath. From the quarry the path skirts round a field to reach a road where the Hertfordshire Chain walk turns left to head back down to cross the A505 once gain, passing the entrance to Ashwell and Morden station on the way. Most off the walk so far had been gently downhill, the path besides the railway lines being about 100 meters lower than the trig point by the water tower in Therfield. Once across the A505 the path now begins to head generally uphill. As I climbed up the track from the road I spotted another hare on the path in front of me. Rather than running off as I approached this one held its ground which seemed quite unusual until I spotted another hare off to the right in the field, photo 12. 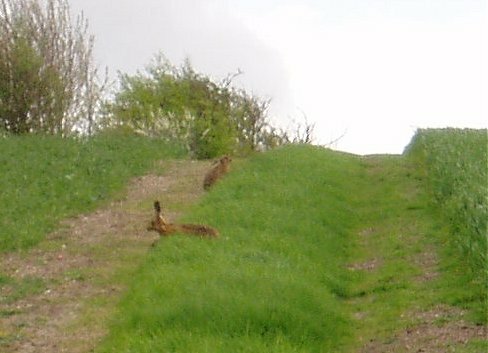 Eventually the hare in the field ran across the path in front of the other one which then promptly also ran off, photo 13. As I continued up the hill hoping my photo's of the hares had come out I passed close by a tomohawk gas powered bird scarer. I don't know about scaring birds but they definitely scare me when they go off unexpectedly, particularly when they are right next to the path; fortunately this one remained silent as I went past. At the brow of the hill I was able to get a view over the fields back in the general direction of Therfield, photo 14. The path then headed down along a track towards Heath Farm. As I descended I spotted yet another hare. 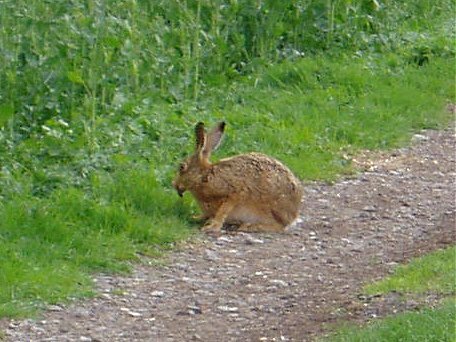 As I had mentioned a few walks ago up until I walked the Hertfordshire chain walk I had only ever seen a hare once before while out walking, this was the fifth one I had seen this day. It was sitting besides the path eating something and once again let me get quite close before running off. Earlier I had been beginning to think I was starting to confuse hares with rabbits until I had passed a very large colony of rabbits besides the chalk quarry which had highlighted how different they actually are, both in shape and size and also behaviour. The path continues along the track to Heath Farm, where I saw the first swallow of the year, and then turns left onto a road. 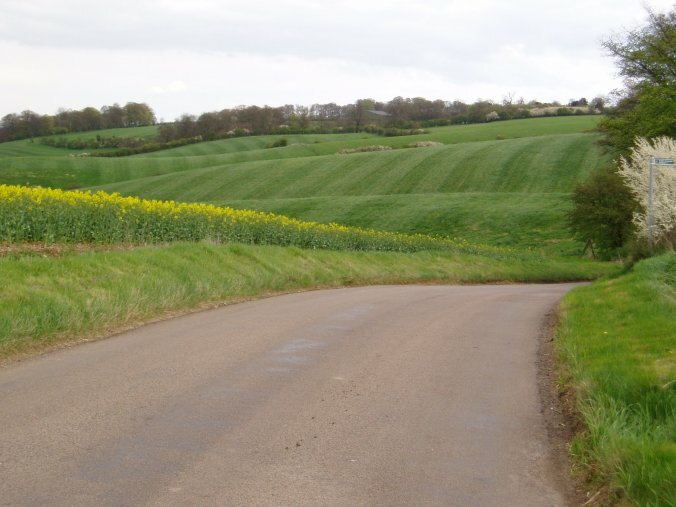 This road, photo 16, runs dead straight and gently uphill for about a mile, or maybe slightly more surrounded on both sides by large expanses of open fields. I was already some way down the road when I took the photo and it continues on over the horizon. The road had very little traffic on it however some of the cars that did pass me were travelling quite fast. The route of the Hertfordshire Chain Walk bears left at a road junction, photo 17, and continues along another road, photo 18, for just under quarter of a mile. Just after Coombe Road is passed on the left the walk heads off to the right, following a hedge along the side of a field. The footpath marker can be just seen in the large version of photo 19. As I was turning off the road I spotted a couple of Grey Partridges. 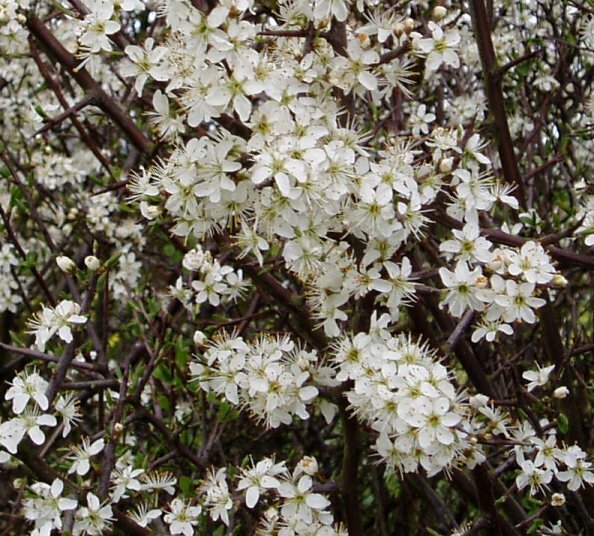 The field was lined with a number of hawthorn trees which were just coming into bloom, photo 20. The footpath heads a cross a number of fields and past some paddocks towards the village of Kelshall. The path crosses the road and heads down Kelshall Street for a short distance, before joining up with the 14th link of the chain walk as the route turns left up footpath 6 towards Therfield Church by Haggers Farm. The path crosses one field and enters another where the footpath splits into two with the route of the 15th link heading off to the left and the 14th link heading off to the right, photo 21. At the top of the field there was a handily place bench where I stopped and had my sandwiches, photo 22. The bench was presented to mark the 50th anniversary of VE day on 8th May 1995. Photo 23 shows the view from the bench which looks across towards Kelshall. From the bench it was only a very short walk back to the car in Therfield. The path passes through the hedge behind the bench and crosses over one more field to join a track just below the water tower, photo 24, passed at the start of walk to complete the stage and also to complete the Hertfordshire Chain walk itself. I have really enjoyed walking the Hertfordshire Chain Walk over the last few months. The paths were generally good and well marked and the countryside generally very pleasant to walk through and surprisingly rich in wildlife. Some stretches got a bit muddy but that was to be expected given the time of the year I did most of the walk. The GPS made this walk 8.18 miles long. ©2008 Bertuchi.co.uk. Please contact me if you have any questions or comments regarding the site. Additional information about places of interest on the walks is always welcomed. All rights reserved. Please contact me if you want to use any of the images or information from the site. Thank you.